Belize NMS: A slight increase in moisture is expected across the country later today as a cold front approaches the area. Advisories: Small craft caution likely to go into effect later today. General Outlook: (Sat and Sat night) Windy, cool and dry weather is expected. Today N-NW 5-15 kts Choppy 3-4 ft ISOLATED SHOWERS, INCREASING. Tonight N-NW 10-20 kts Moderate-Rough 5-7 ft ISOLATED SHOWERS, FEW MORE SOUTH. GUSTY WINDS PRODUCING LOCALLY ROUGH SEAS. SMALL CRAFT CAUTION WILL GO INTO EFFECT. Tomorrow N-NW 10-20 kts Moderate-Rough 5-7 ft MAINLY FAIR AND COOL. GUSTY WINDS A LOCALLY ROUGH SEAS. SMALL CRAFT CAUTION. Outlook N-NW 10-20 kts Moderate-Rough 5-7 ft MAINLY FAIR AND COOL WITH GUSTY WINDS PRODUCING LOCALLY ROUGH SEAS. SMALL CRAFT CAUTION. Half an hour ago it was so foggy I could barely make out the end of my dock. As of now visibility has improved and the horizon is visible (fuzzy but visible). 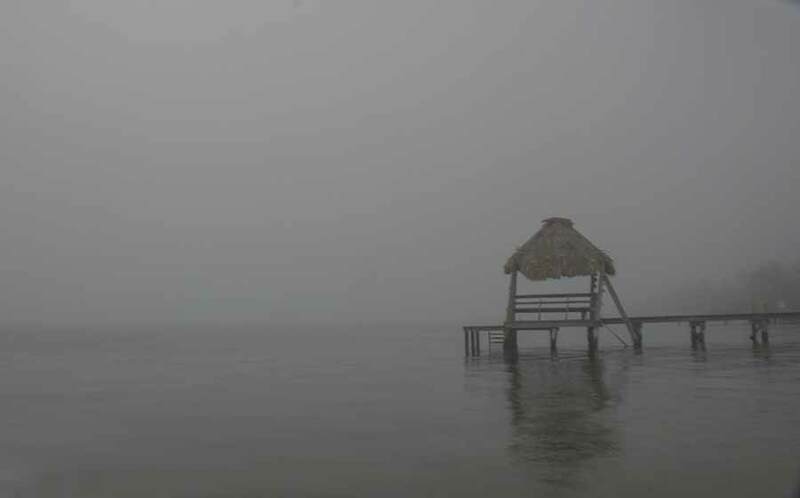 On Ambergris Caye this morning we had a heavy fog. It's rare that the island experiences fog. The sea is flat calm and sky is now clear at 8:30. 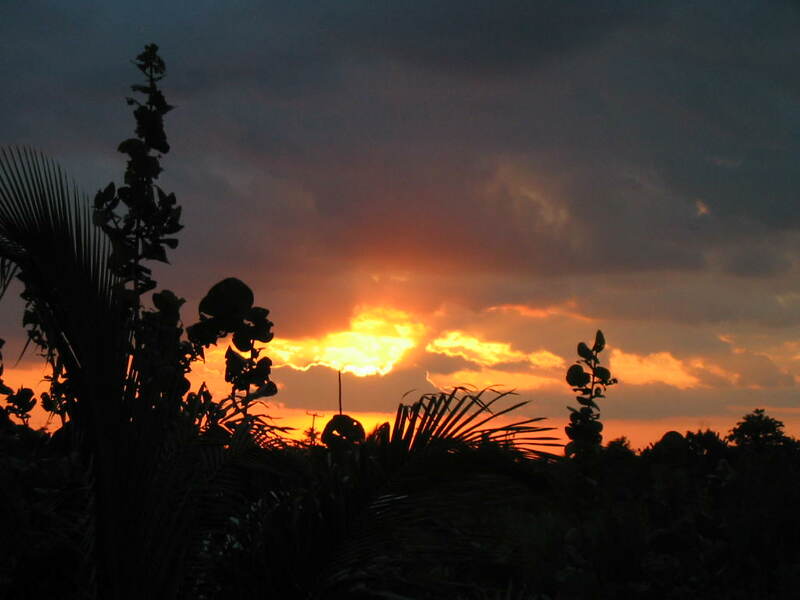 Our expected high today is 80 f.
Presently the southern half of Belize is in bright, clear sunshine and parts of the north, but much of central Belize is under cloud, probably caused by the clear night sky. 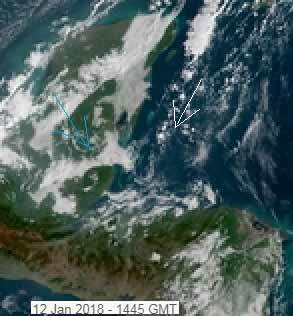 There is cool air from the NNW coming down over Belize at present, the Caribbean air is being pushed away, out to sea. As the day warms up, this cloud over central area will melt away. The Caribbean wind will also start to push back and could cause a little rain as it clashes with the cooler NNW air. Both NOAA and the Navy satellite pictures still not working. Looks like today will be mainly sunny eventually, with some white clouds developing later, little or nor rain.